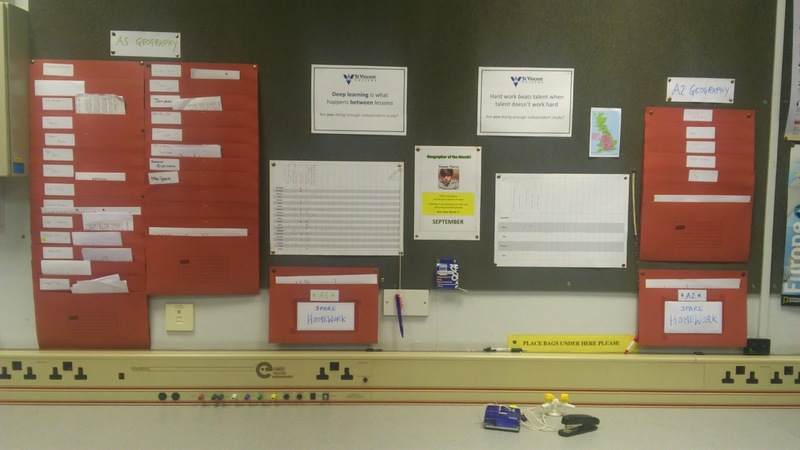 geogarific: Homework Wall To Organise Your Students! I've received quite a few compliments from colleagues since I created this, including our principal, so I thought it would be good to share my idea here. I created a pocket for each student by stapling lots of folders together and then pinning them to the wall (I found a set of 50 folders reduced to £5 in Staples) and, in our first lesson I got them to write their name on a sticky label and attach it to their folder (in alphabetical order). One folder I saved for 'spare homework' - I normally print out a couple of extra copies and put them in here each week. I also attached an A3 sheet to the wall consisting of a table with one student per row and enough columns for terms worth of homework; each week I write in a brief description of that week's homework. Finally I have used lengths of string to attach a stapler, a hold punch and pens to the wall/desk in front. When my students come in, or during the lesson at an appropriate moment I get them to put their homework in their pocket and tick their name off on the A3 sheet. If they have more than one sheet they have to staple them together. If they missed a lesson or lost their homework they know where they can find a spare copy before the deadline (spare copies also available for them to print from our VLE). They can also use the hole punch to help in filing away their work. I don't end up with any random nameless pieces of paper as they are all stapled to a sheet that does have a name on. Once students have left I write 'L' in red in any blank gaps on the tracking sheet. This enables both myself and the students to keep track of missed deadlines. My stationary doesn't get lost! When I collect them in they are all in alphabetical order; I try to keep them in the same order when marking so it's easier to put grades into my Excel tracking sheet. I can easily see during the lesson if anyone hasn't handed in their homework and challenge them about it without having to waste time looking through the pile and trying to work out why I only have 16 instead of 20. There have been some glitches, such as students ticking their name off but not having handed in homework, but this is rare and I normally do a quick check when collecting them. Let me know if you have any good organisation ideas! My next challenge is how to get my students to file away every single handout and sheet of notes they make in class in order, as opposed to losing half of them and filing the other half in a big mess!! p.s. The poster in the middle is for 'Geographer Of The Month' (an award for which they receive a bar of chocolate) and some reminders and inspirational quotations either side to encourage independent study.